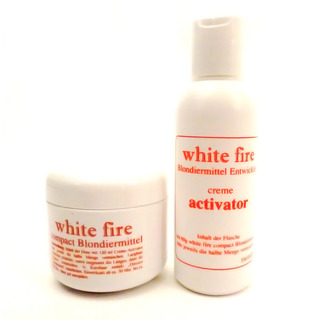 Directions Bleaching Set,consisting of White Fire Powder Bleach (120 ml) and white fire Activator 3 % (60 g). This is a scalp-protecting bleaching set which doesn't lead to many unwanted undertones (gold, yellow, red). It covers the hair well and can be applicated for up to 90 min. Of course it was not tested on animals, and it's vegan. How to use: Mix powder and activator in a plastic tray (use all of it or half of each). Let steep for a few minutes. Wear appropriate gloves and use the whole mixture. You can apply the mixture with gloves or with a comb. Rinse after 30-90 minutes. Please note: Bleaching mixtures can cause allergic reactions. It contains hydrogen peroxide. Avoid contact with eyes, skin and submucosals. After contact rinse well with water. Keep out of reach of children. Do not use if your scalp is sensitive, damaged or irritated. Don't use it when you're known to be over-sensitive towards persulfates. Store in a cool, dry and dark place.